Located on a large hillside parcel in the prestigious Bennett Valley area of Santa Rosa, Casa Patricia is a 4 bedroom, 5 bathroom private residence. 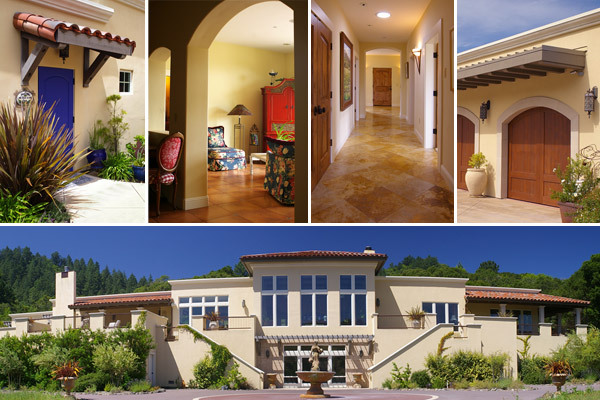 This 8310 square foot Mediterranean style home embraces the spectacular views and pastoral elegance of the site. Arched openings, tiled floors and pastel colors continue the design theme into the interior spaces, which include a wine room, home theater and high ceilinged great room. The three-car garage is accessed from a circular auto court on the uphill side of the home and this area leads through a gateway into a walled courtyard with a pool and fountain. This courtyard provides access to the both the home’s main entry and the recreation room, as well as providing shelter from sun and wind. The downhill facade of the home showcases valley and mountain views from over 2200 square feet of outdoor terraces with slate floors.